Kia ora whanau! As most of you know, Sarah and I both work part-time at Papanui Baptist (24hrs per week), which allows us both to engage in further studies on our ‘off’ days (when we get them!). 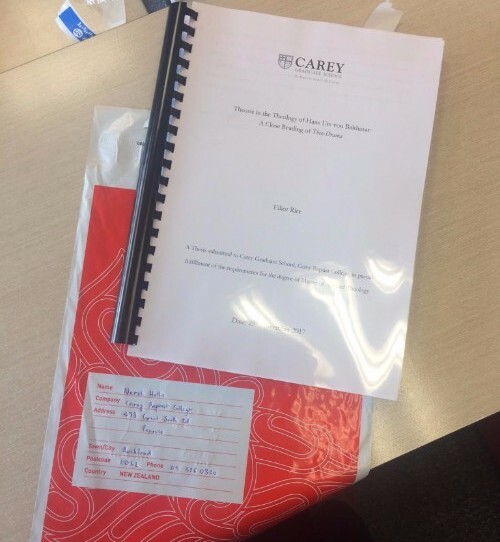 I’m very happy to update that yesterday I submitted my thesis, which I’ve been working on part-time for the past three years, which means I’ve now completed my Master of Applied Theology through Carey Baptist College. Now comes the nervous wait for the result, which will take some time. Meanwhile, Sarah earlier this month celebrated completing her Post-Graduate Diploma of International Development through Massey University, which she too has been working on these past three years. She’s now writing her proposal for the thesis, which she’ll write to complete her Master of International Development. This will see her engage in research in Fiji for the next couple of years (while remaining at PBC of course). I’d like to say a personal thanks to you all for your kind support of me through this project. Thanks especially to the staff, elders, and my Co Senior-Pastor, who’ve done so much to enable me to get to the finish line.